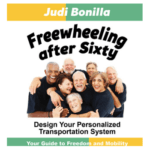 Freewheeling After Sixty is my mission to disrupt the dreaded “Keys Talk.” By improving driving skills, understanding transportation, and planning I say in four years or sooner we can improve transportation for aging America. To order a signed copy contact me and I’ll ship the book directly to you. Remember with each conversation we are closer to reaching 40,000 by 2020 on their transportation options.